Ah, Pinterest. It's easy to scroll through page after page of beautiful looking crafts thinking "oh suuuuure, I could totally recreate that at home." Well, after my latest browse through those hallowed boards, I decided to put this confidence to the test and give a Christmas-themed craft a whirl. And I had all of the materials readily to hand. It's hard to resist a delicious frothy soy hot chocolate on a cold day, so I've been indulging in a Starbucks or two lately to curb the winter chill. But instead of throwing my cups away, I have kept them and turned them into a magical Christmas tree. Yes, you heard that right. 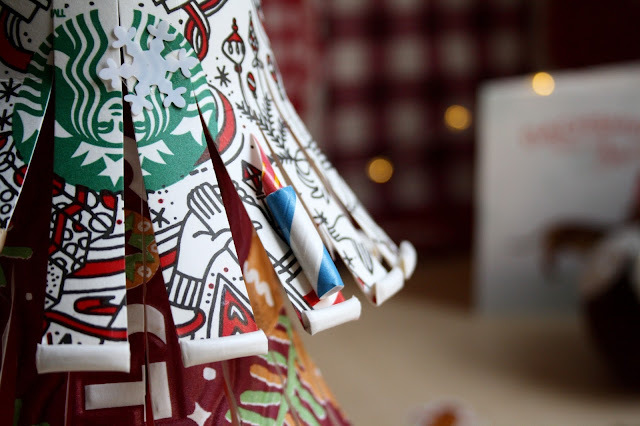 If you're a Starbucks-aholic or a Costa craver, this is the festive craft for you. Cleaned out coffee cups of various sizes: smaller ones for the top of the tree and larger ones for the bottom. Riboon, sequins, coloured paper and other pieces for decoration. Step One: Start cutting your coffee cups into ribbons, stopping about 3/4 of the way up the cup so that it still holds together. 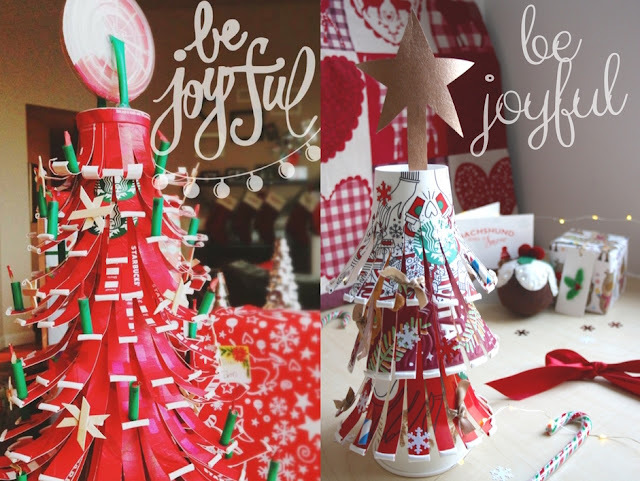 Step Two: Bend out the bottom of the ribbons to give them a curled effect like tree branches. Step Three: Use a pair of scissors to pierce a hole in the centre of the bottom of your coffee cup. Step Four: Poke your paper straw through the hole in your cup. Keep threading more cups onto your straw until you're happy with the effect. Put your larger coffee cups at the bottom of the straw and smaller ones at the top. Step Five: Stand your creation on top of an upturned small coffee cup to prevent it from falling over. Step Six: Decorate! I stuck on snowflake sequins and gold ribbon for that extra Christmassy effect. I also cut another paper straw into short lengths and inserted a piece of red/orange paper in the top to emulate a candle. As an alternative to the coffee cup topper as the crowning glory of my tree, I created a star out of rose gold paper instead. The possibilities are endless! So there you have it - a not quite perfect but fairly decent attempt at a Pinterest craft! Are you suitably impressed? (The correct answer is yes btw). 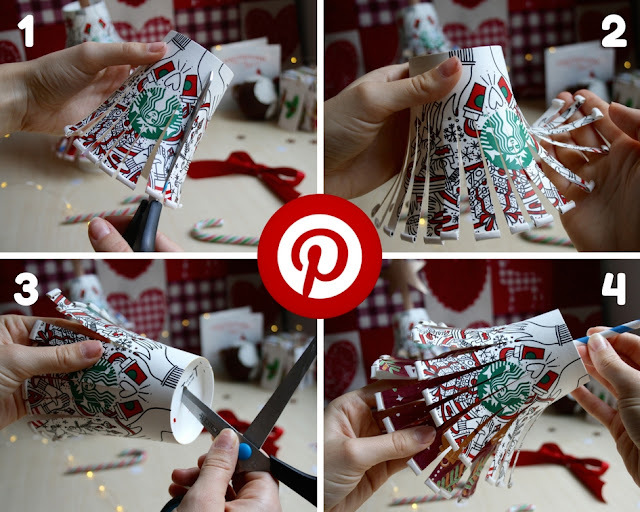 Have you ever recreated anything you've seen on Pinterest? 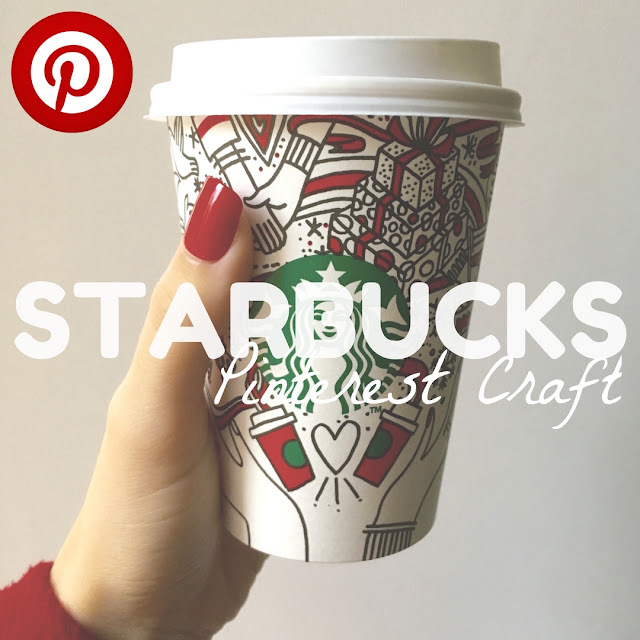 If you're a big pinner, leave your Pinterest link in the comments below so that I can follow you!